At least 16 people have been killed during a Turkish army offensive against the Kurdistan Workers’ Party (PKK) in the southeastern Kurdish city of Cizre, a local journalist told RT. The city residents have been ordered to stay indoors. “Sixteen people died after eleven days of Turkish siege… they are bombing civilians,” the reporter who wished to remain anonymous, told RT. Footage from Cizre shows the city falling under shelling with tanks moving around. Several buildings were destroyed, schools among them, the reporter said. 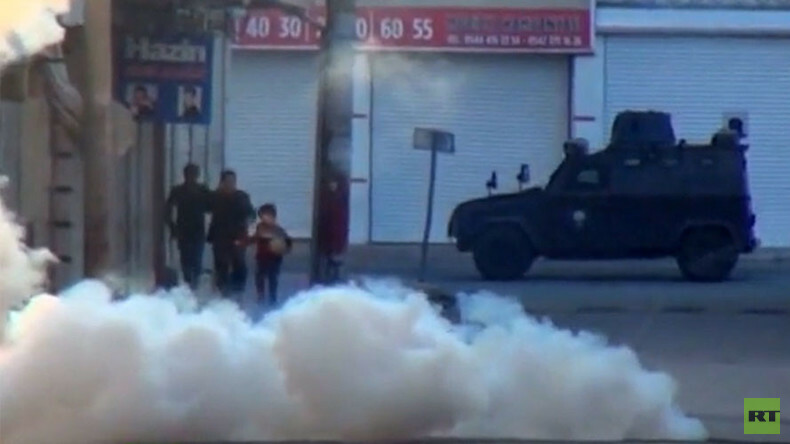 The police also used tear gas and water cannon on a crowd of mourners as they, in their hundreds, tried to march in a funeral procession carrying the coffin of two PKK activist killed in another incident this week. The crackdown on PKK in Cirze and other cities, including Diyarbakir and Silopi, escalated in mid-December. The pro-Kurdish Peoples' Democratic Party (HDP) estimates that at least 31 civilians were killed in the fighting. Turkish state media reported that 168 PKK militants have been killed in the large-scale military offensive. Human Rights Watch (HRW) said “well over 100” deaths of Kurdish civilians have been recorded over the past six months in southeastern Turkey. The organization called on the country to scale back its operations in the region and investigate.